The Pareto principle, or “80-20 rule”, was invented by the Italian economist and sociologist Vilfredo Pareto in the 19th century. The rule is simple: 80 % of the tasks create only 20% of value while the remaining 20% of tasks create 80% of the benefits. Which means that only a small amount of tasks is critical for a project’s success. It is important to identify and prioritize the tasks that generate the most value because by doing so a lot of time can be saved. For project management, it will help the project team focus on the most important tasks. There should be a project plan in which objectives should be set and tasks should be scheduled carefully according to their importance to the project. The 80-20 ratio is not absolute, but it should be used to maintain the greater picture and not to get lost in the details of a task. 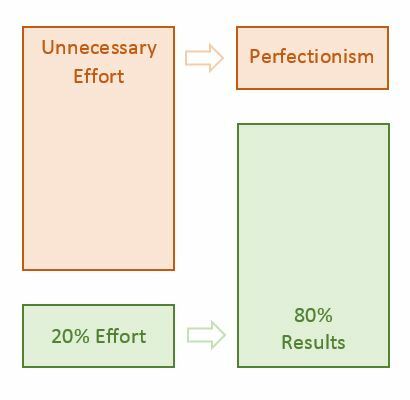 What is the Pareto principle? • Copyright 1999-2019 © InLoox, Inc. All rights reserved.